Raising money for major restoration works, a new building or an endowment which will create a permanent asset for your organisation is a special and particular fundraising art. Capital campaigns require precisely defined, tightly structured fundraising strategies that can radically improve the fundraiser’s chances of success; however, smaller organisations often lack the resources to hire specialists to manage their campaigns for them. This guide gives the fundraiser, the CEO, the trustees and other management staff the information necessary to run a successful capital campaign – with or without a consultant’s input. 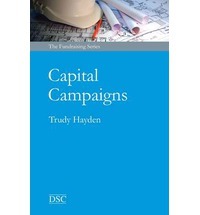 This book will prove a valuable resource to all fundraisers, as well as a general introduction to the art of capital campaigning.